Camellia sinensis is the species of plant whose leaves and leaf buds are used to produce the popular beverage tea. White tea, yellow tea, green tea, oolong, pu-erh tea and black tea are all harvested from this species, but are processed differently to attain different levels of oxidation. Grown almost exclusively for use as a beverage, tea is perhaps the world’s most undervalued medicinal plant. Numerous studies point to the health-giving properties of the tea leaf, especially unfermented green or white tea. These teas contain high levels of polyphenols, which have potent antioxidant activity. Drink a few cups of green tea a day, five is believed to be the magic number, to stimulate fat loss. Put the tea leaves (on average 1 tsp / 250 ml) into the infuser and put into the teapot with hot water. Leave to infuse the required time (usually between 3 and 6 min). For tired, irritated, and puffy eyes, place a moist tea bag or a cotton ball that has been soaked in cooled green tea on the affected (closed) eye for a few minutes. Usually symptoms are eased and the eyelids and surrounding tissues are toned. Tea can also be used in this way to counter inflammation or infection within the eye, for example, in helping to relieve the pain and discomfort of conjunctivitis. Tea is a valuable astringent for treating skin eruptions and allergic reactions or inflammations. The strong infusion can be used directly as a wash. Tea also makes a very effective astringent and pain-relieving sitz bath for treating haemorrhoids. Sow seeds in spring when nighttime temperatures reach 55F (12C) or more. Soak seeds in water for a day or so before planting, and keep purchased seeds moist and viable in the refrigerator before planting out. When you start seeds, try placing them in small pots indoors in a sunny window with a combination of perlite and orchid mix. Mist them frequently. Seeds sprout in four to six weeks. Your plant should be around 3 years old before you can start harvesting leaves. 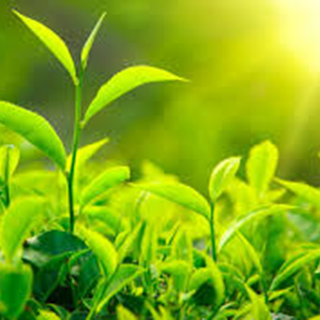 Depending on your climate, tea plants will leaf out at least once a year, usually in spring. This new, young growth is what you'll want to harvest for tea.